I know, I know, this is probably not the most original post. 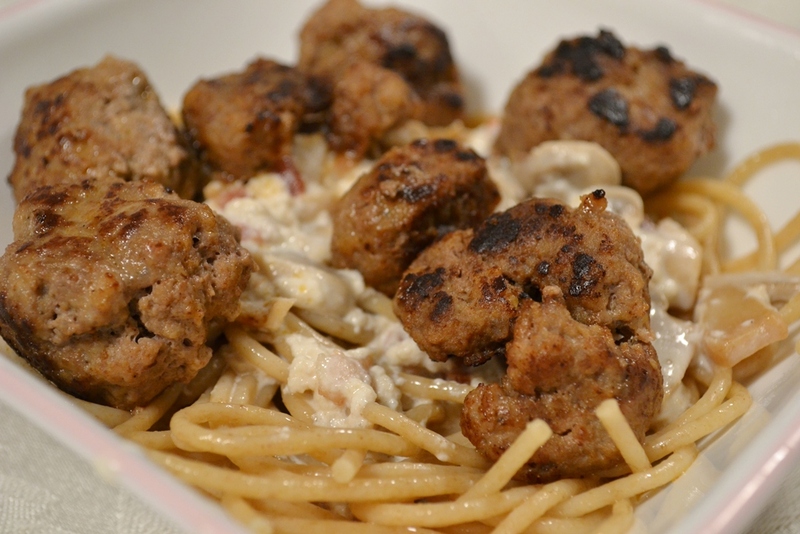 Meatballs are so common, so simple, so…everyone can make meatballs. Right? What can I say? This was my weekend “I am in the kitchen” project. Yes, boring, but I had no spark of genius this weekend to bake something amazing. I guess I am not one of those bloggers out there that bake every day. Wait! I know FOR SURE that I am not one of those bloggers. Anyway, for those cooking beginners amongst you, here is a simple recipe for some good meatballs. Cooking is not so much precise as baking is but it’s nice to have a guideline. Some cooking can be quite complicated and when you do that (like Coq au vine) you should stick to the recipe. Meatballs however, do not belong to that category and you can switch things up. There goes the ketchup and mustard. Freshly bought ground meet is ideal but if you have it frozen that’s just fine too. Defrost the way you like but don’t put it in the microwave. When you nuke it, it tends to cook and you don’t want that. You can defrost it in the oven: turn you oven to 50°C or even 100°C and place the meat on a cookie sheet. (Line it with wax paper or baking paper first though.) Cover the meat with aluminum foil to keep it from cooking. After a while you should remove the layer that is defrosted. Grate the onion, or finely chop it up, mix the beef and pork and add the onion. Add all other ingredients and mix until you have a nice consistency. You might need more bread crumbs, depending on the meat, the size of the eggs and so on. This is the part where you either know or don’t know. If you don’t know, don’t worry. 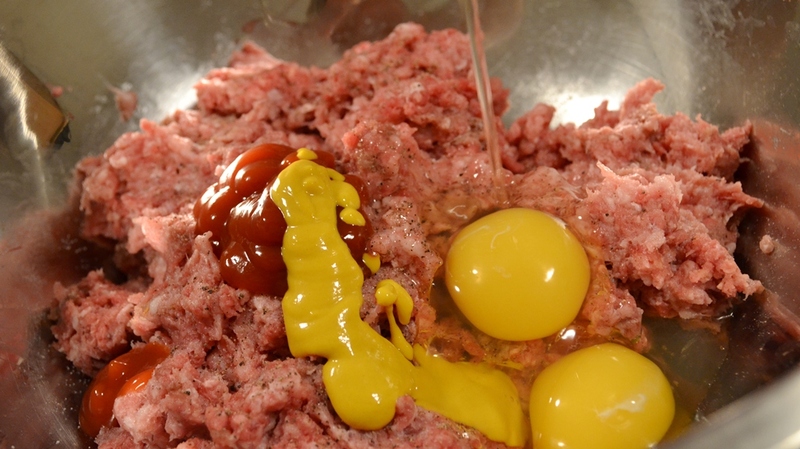 The eggs and bread crumbs are necessary for the meatballs to stick together when you fry them. 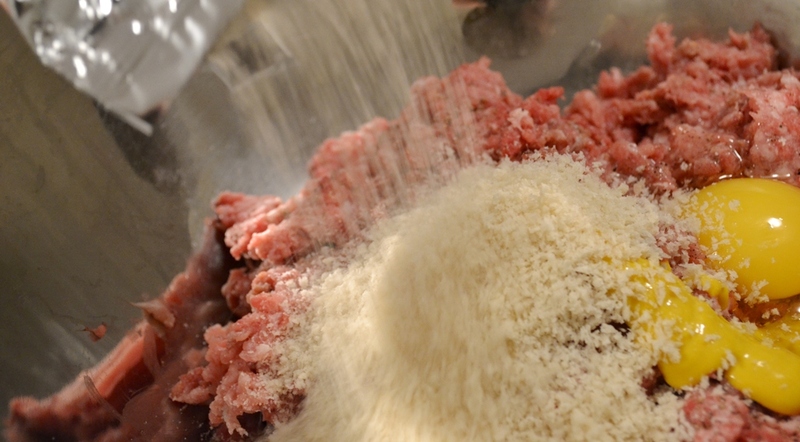 If your meatballs fall apart then you know you didn’t use enough bread crumbs. (Two eggs are usually enough.) 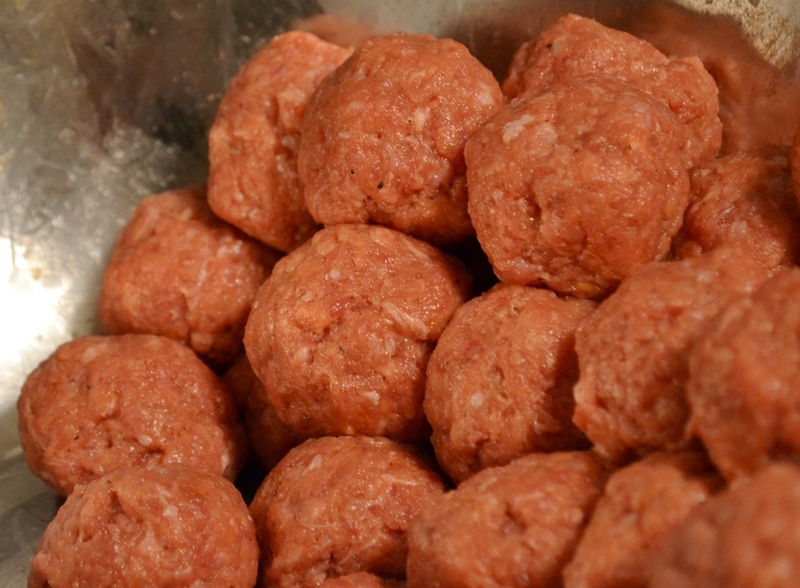 Make a little batch first and see how your meatballs behave in the pan. That way you can add more crumbs to the others. Form some meat balls and throw them in the frying pan. 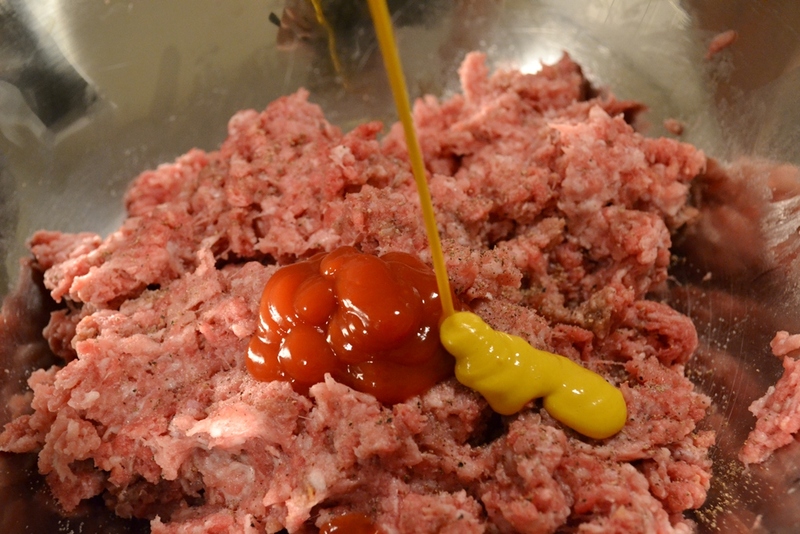 The ketchup and mustard, along with salt, pepper and paprika, will give your meatballs a nice flavour. 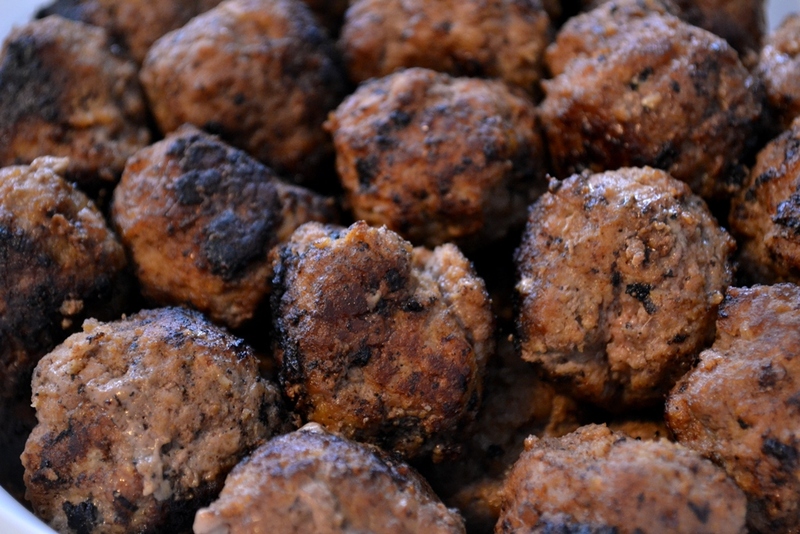 You want to taste test your meatballs before you fry them (or bake them). I always try a bit of the raw portion I made and see if I taste some flavour. I think some people might not like that, which is just fine. If you don’t want to do that, you don’t have to. But maybe you want to fry one meatball (or microwave it) and see how it tastes. Forming the meatballs shouldn’t be too difficult either. Take a portion and roll it in your hands. The size is up to you but I advise you not to make them too big. Otherwise you will have a brown meatball on the outside and a raw one in the inside. Also, it’s very unlikely your meatballs will be perfectly round. I never had one that was that way and I don’t try anymore. Of course you are welcome to do so and let me know if you succeed. Now you can serve them with classic tomato sauce, but why not change it up a little? How about a Creamy Mushroom Sauce? Fry the diced bacon until crisp and put aside. Melt the butter and saute the mushrooms (fresh or canned) and add the whipping cream. Bring to a simmer and add the bacon, shredded cheese and spices to your liking. Let it simmer for a while and serve hot on spaghetti. Posted in Cooking and tagged beef, bread crumbs, cooking, ketchup, meatballs, pork, recipe. Bookmark the permalink.